This tutorial provides you with a foundation for working with Adobe Photoshop Elements graphics. It is the tenth lesson in the Adobe Photoshop Elements 10 Digital Classroom book. The photos you choose are the most important part of any slide show. However, they aren’t the only part: text and graphics are often added to a slide show to enhance the effect of certain slides or to add emphasis to important parts of your images. Another important factor for creating a good slide show is your audio. While you don’t have to use audio when creating a slideshow, good audio can help to establish the mood of your project. Audio can be added to a slide show, either as background music, commentary track, or as a voiceover to match specific slides. To add an audio file that plays in the background of your slide show, you can do so very easily using the Add Media button ( ). Audio plays as your slide show progresses, and automatically stops at the end of the show. 1 Press the Click Here to Add Audio to your Slide Show button at the bottom of the storyboard. Click to add audio to the slideshow. 2 Navigate to the airshow folder in the Lessons folder and select airshow soundtrack.mp3. Press Open and the audio file will appear at the bottom of the storyboard on the audio track. Preview the slideshow by pressing the Play button at the bottom of the viewer. Press the pause button to stop the slideshow. 3 If your slide show is longer than your audio track, the audio track will automatically repeat. The audio is a little too loud, but you can adjust this. Click the audio track, airshow soundtrack.mp3 to highlight it in blue and lower the audio slider in the Properties field in the Panel bin by dragging the slider to the left. Press the Play button above the audio slider to hear the music play as you are adjusting it. Press the pause button above the audio slider to stop the music playback. If you want to auto adjust the duration of each slide to play for the entire duration of your audio track, press the Fit Slides To Audio button ( ) at the top of the Storyboard. 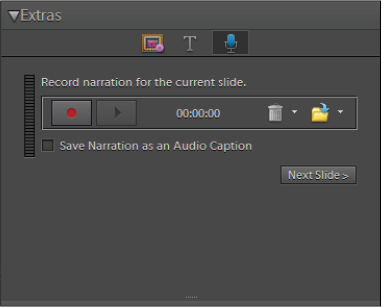 If you have a microphone attached to your computer, you can use it to add narration to one or more slides in your project. Unlike background audio, the narration track is attached to each slide and automatically changes the slide’s duration. The narration interface looks very similar to a standard tape recorder, with controls to record, stop, and play. It also includes controls for inserting saved audio tracks as narrations and deleting saved narration tracks. The recorder is just like a physical tape recorder. 1 From your Panel bin, click the Narration tool ( ) to activate it. 2 Select the slide you would like to add the narration to, and press the Record button. 3 When you are finished with your narration, press the Stop button. Adding narration can increase the duration of the slide. If your narration is longer than the slide’s display duration, Photoshop Elements automatically increases the slide’s display length. 4 Press the Play button to listen to the narration you have just created. If you are happy with it, move on to the next slide. If you are not happy with the narrative track, press the Delete button ( ) to delete it. If you are using a soundtrack with your slide show, it can interfere with the viewer’s ability to hear the narration, if the soundtrack is too loud. Once you have created your slide show, you need to decide how to distribute it to your audience. Photoshop Elements supports a variety of distribution methods. Once you have decided on a file type and decided on the specific settings you want, press the Output button to build your file. Once the file has been created, you can do whatever you like with it; you can e-mail it to your family and friends, burn it to disk, or save it on a flash drive.